Children of Andy Robertson, writer for Wired's GeekDad blog, reached their limit of videogame time over the weekend, but did not want to stop playing Skylanders. The kids continued to play with their action figures, but weren't allowed to integrate them with the Skylanders: Spyro's Adventures videogame any more. So, what did they do with their time? 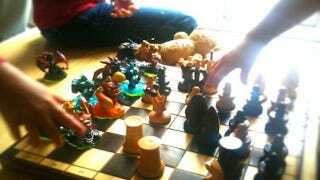 The children and their father spent the next two hours creating the rules to a version of Skylanders chess based on the different characters' skills. What began with accidentally knocking over pieces to a chess game quickly turned into a new, detailed version of the classic board game that the children grew to love. I think it's great to see this kind of creativity from kids especially when videogames are the inspiration. This wholesome, fun experience is part of the reason we recommended Skylanders: Spyro's Adventure to families. I hope the kids spread this to their friends, and that it incites more creativity. It could work towards reversing the negative image videogames have as mindless entertainment for today's youth. Mind you, everything should be done in moderation, but gaming can help spur the imagination, as seen in this case. Make sure to hop over to the GeekDad blog to read the full rules and give the game a try, if you have enough of the toys.